Today I woke up with a craving – so I hopped in the car to pick up 2 Wendy’s Baconators with cheese. The first one went down well with a large Coke… nah, I’m just kidding. Had to throw in some stupid April Fool’s joke in today, right? 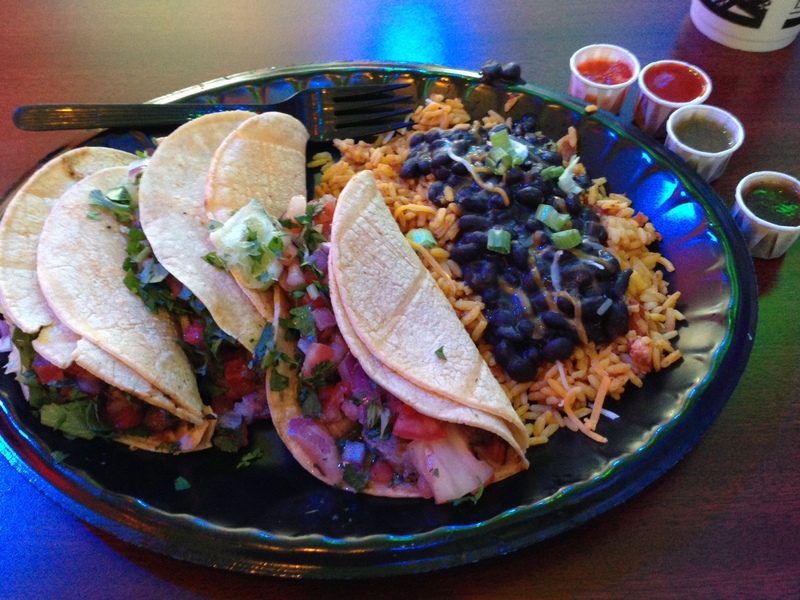 Actually, like most Tuesdays, I like to head to Tijuana Flats for their “Tijuana Tuesdaze” special. But today I wasn’t in the mood for their special – in fact, I wanted to try something that I’ve seen on their menu but never considered… until today. Since it’s April Fool’s Day, why not fool myself into thinking that I’m at a Mexican taco stand? So today I’m trying their street tacos. Now any self-respecting taco fan knows that the tacos they shell out at a lot of restaurants and fast food joints are “American tacos” – you know, the kind with lettuce, tomatoes, cheese, and maybe even sour cream, all in a crunchy shell. I actually like street tacos better – the ones that come in a soft corn tortilla with nothing but meat, onions, and cilantro. So I decided to give Tijuana Flats’ version of street tacos a shot. First of all, they’re the biggest street tacos I’ve ever seen. They put tomatoes in theirs – that’s okay with me. The steak was flavored nicely and they were definitely filling. Overall, not bad – I don’t know if they beat some of the taco stands in the area, but they are closer to my condo than any other place, so that’s a major plus.